Deacon James A. Thompson, 82, a retired permanent deacon who had been assigned to Stella Maris Parish in Philadelphia, died Dec. 13. Born in Philadelphia, he graduated from La Salle College and served in the United States Navy from 1952 to 1956. He was a federal civil service employee for 39 years, and to further his career with the Defense Contract Audit Agency he studied contract law at Temple University. Married to the late Charlotte R. (Kirkpatrick) Thompson, he is the father of Kevin and the late Colleen Thompson. He retired early from the federal government even though he loved his work after he decided to enter the diaconate, and he was ordained deacon on June 6, 1999 by Cardinal Anthony Bevilacqua at the Cathedral Basilica of SS. Peter and Paul and assigned to his home parish, Stella Maris. “He was a holy man, very charitable. He was completely fascinated by the charity of Christ,” said Msgr. 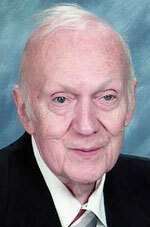 James Connelly, pastor emeritus of Stella Maris, who was well aware of what his tuition coordinator was doing. “He would lend people money to pay their tuition and he would never get paid back. I told him not to do it, but he would do it anyway. Deacon Thompson’s funeral Mass was celebrated at Stella Maris on Dec. 19 by Bishop Robert P. Maginnis. Concelebrants included Father John DiOrio, current pastor of Stella Maris, and Msgr. Gregory J. Parlante. Deacon James J. Duffy was Deacon of the Word and the homilist. In addition to his son, Deacon Thompson is survived by his daughter-in-law Lisa; grandchildren Erik, Ryan and Megan, and his brother, Thomas. Interment was at SS. Peter and Paul Cemetery, Springfield. I miss you so very much, poppy. Not a day passes that you are not in my mind. Happy you are free of illness and with Mom-Mom and Aunt Colleen. I love you so much and hope you are proud of me.